Life's hard enough for teenagers trying to navigate puberty, senior school pressures and friendship issues, amongst other things, without the added burden and trauma of losing someone they love. 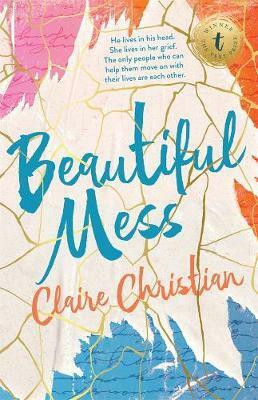 Claire Christian delivers an honest and searing depiction of the flow-on effects of grief in her debut novel, Beautiful Mess, winner of the 2016 Text Prize. Months after the suicide of her best friend, Ava's life continues to spiral in a fog of anger and bad choices resulting in being expelled for her public outburst with the principal. The only thing in her life she can tolerate is her part-time job at Magic Kebab where she meets Gideon. Gideon is one year older, writes slam poetry and lives with constant shyness and anxiety. He's cut himself off from social media and his friendship with Ava develops by writing letters to each other. Both flawed and vulnerable characters hurting in their own way, they're drawn to each other by their differences. It's these differences and personal pain that creates new experience, hope where there was none and a platform to help each other heal. Claire Christian reveals both characters' perspectives as told in alternating views and the mental health issues both are dealing with are raw, honest and cleverly interspersed with humorous moments and lighter characters such as Gideon's two mums and sister. Although weighty themes of anger, grief loss and mental health are explored in detail, they are consistent with the realistic and painful experiences faced by Ava and Gideon. They screw things up and feel dejected ... a lot. They're both a mess but as the title states, they are a beautiful mess and slowly begin to heal together, like the Japanese art of Kintsukuroi - when broken porcelain is reattached using gold to make it more beautiful. Hope and solace are received when the characters seek help along the way amidst the light and dark moments. I loved the ending; it was realistic and satisfying and left me wondering. A book with a lot of grief, heart, hope and a useful compass for teens facing similar issues. This book explores issues of mental health and has sexual references.